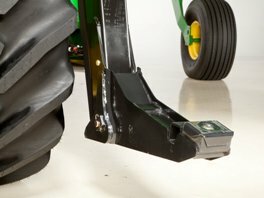 Attaching and detaching platforms is easy, allowing fast and narrow draper transport and the ability to quickly change from hay to grain harvest. 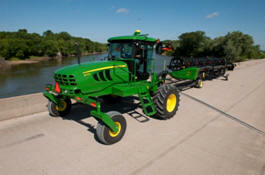 This also allows those with diverse operations to use the machine for more hours annually, spreading out their costs. 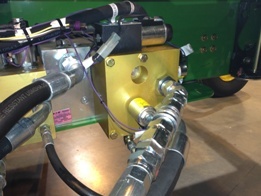 A single-point multicoupler on the right-hand side of the machine stores easily out of the way for hay use and is conveniently connected to the platform usng the multicoupler. 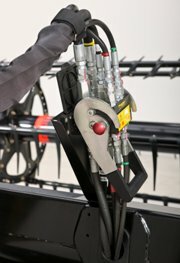 The storage position keeps hydraulic and electric connections away from moving components and secure for transport. 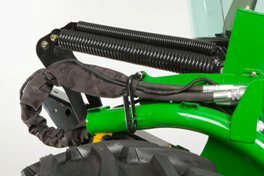 Uniquely sized locking flat-face quick-attach couplers provide easy attachment and make connecting virtually fool proof. 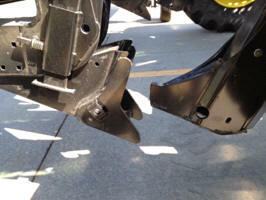 A self-latching center link comes with the optional hydraulic center link, making connecting the platform easy. 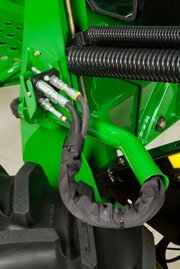 The other optional kit for center link vertical alignment makes attaching and detaching a breeze for those who move fields frequently or want the ease of attaching. 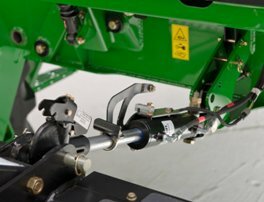 This kit gives the capability to move the center link up and down with a cylinder under the cab controlled by the reel fore-aft buttons on the multi-function control lever. 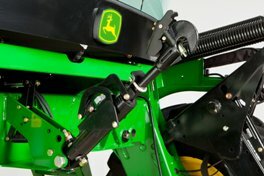 The pin on lower-lift arms allows easy change over from draper to auger platforms and also changing from wide draper in-field operation to narrow transport. Springs are easily adjustable. 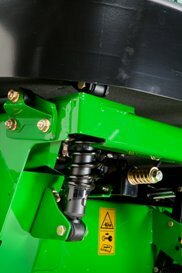 Simply raise the platform to relieve spring pressure and turn the bolt to adjust the leverage on the springs. This allows changing platforms quickly and easily. The float-fine adjust is in base equipment and available on the W150 only. 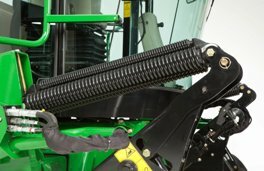 It uses a small hydraulic cylinder to adjust spring length and force independently on each side. This also allows changing the platform float for varying field conditions on the go and has three memory positions from which to select. The float-fine adjust also allows rebalancing the platform when using the deck-shift feature using the same controls on the armrest. Storing 400D Platform with a W150 is easy with great visibility and control to push the platform in through narrow doorways for off-season storage. 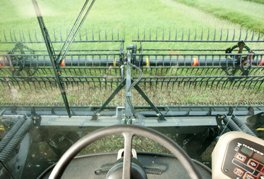 AutoTrac guidance ensures the full width of the platform is engaging crop at all times, leading to increased productivity and more acres covered in less time. 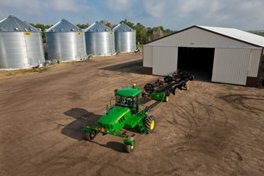 The W150 Self-Propelled Windrowers are GreenStar™ (GS) ready. 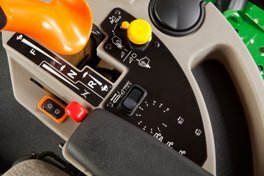 All cabs ship from the factory (in base equipment) with GS harnessing installed and ready to accept the StarFire™ receiver, GS Display, and an AutoTrac Universal (ATU) 200 steering kit, or integrated hydraulic AutoTrac kit. Transport wide draper platforms with ease and control using the ballast box and 400D with an integrated transport system. The optional ballast box enables the power unit to safely transport without a platform. It also enables narrow transport when used with a 400D Platform with the integrated slow-speed transport system. The ballast box shifts weight onto the drive tires for traction and control when in transport. 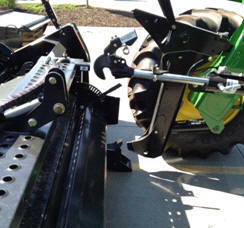 It also has a hitch for attaching and towing the 400D Platform. 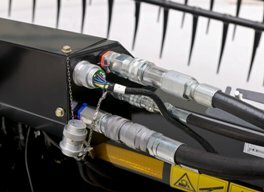 It is required to have the electrical wiring harness and hitch pin kit to provide a seven pin connector on the ballast box for lighting. This provides the W150 and 400D Platform with visibility for safe transport. 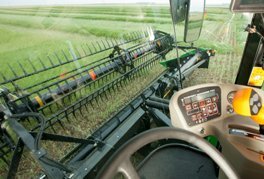 Large, wide-front glass and cab positioned forward and above the platform give excellent visibility to the cutterbar and incoming crop across the widest platforms. 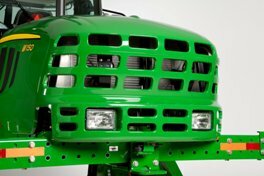 This allows ease of operation and maximum productivity even in the toughest cutting conditions. 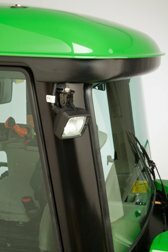 Halogen lighting is used to give the operator excellent visibility when operating at nighttime or in low-visibility conditions. Automotive-type lamps use replaceable bulbs for easy service. Seven headlights are mounted on the front of the cab to illuminate the cutting area in front of the platform. 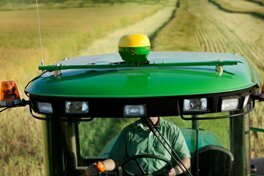 This gives excellent visibility to the crop and obstacles in the fields. Two rear work lights are mounted on the rear of the machine. 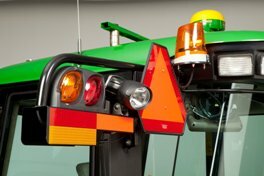 Two adjustable side or rear-facing work lights are mounted on the rear of the cab to illuminate the area to the sides and rear of the machine. 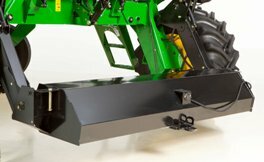 This allows seeing stubble and obstacles in the field. The left-hand side light has a delay egress feature. When transporting in road range, the flashing hazard lights (and beacon lights if equipped) come on automatically. An optional HID lighting package (two mirror-mounted HID lights) is available to provide additional lighting. Optional warning beacon lights are available, providing additional visibility during transport. Four-point independent suspension delivers a smoother, more comfortable ride. The W150 has four coil-spring shock absorbers working in conjunction with fore-aft and side-to-side stabilizers to minimize cab roll. 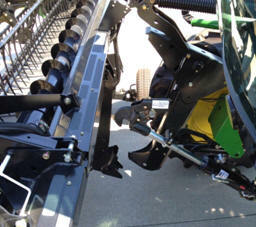 The shocks are placed at each corner of the cab so the entire cab can go up or down from the resting position. This suspension makes the W150 one of the most comfortable cabs in the industry.